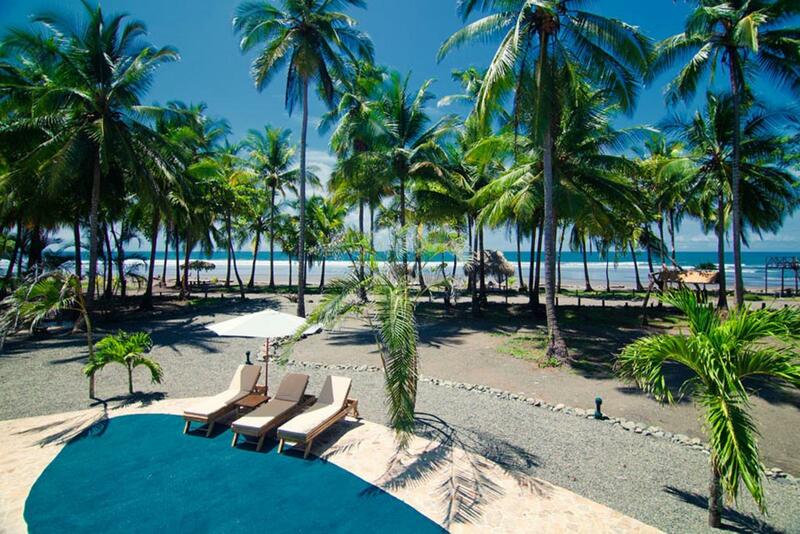 The Clandestino Beach Resort is an intimate boutique hotel located just a few miles from the small town of Parrita. This area – which lies along the Pacific Coast 15 miles (25 km) north of Quepos and 28 miles (45 km) south of Jacó – is studded with beaches and is reasonably close to the Manual Antonio National Park. The hotel itself is set near the head of Playa Isla Palo Seco, a 7-mile (12-km) barrier island that is bounded on one side by the Pacific Ocean and on the other by an estuary. The area has abundant natural beauty and there are numerous activities to help visitors enjoy it, including mangrove tours, horseback rides, and snorkeling trips. There are good waves for surfing and excellent hiking within the Manual Antonio National Park, which is just south of Quepos. Relaxation comes easy while staying at the Clandestino Beach Resort. From the pool to the beachside ranchos, the hotel’s inviting atmosphere encourages tranquility and comfort. Guests can cool off during the day in the large swimming pool or soak in the turtle-shaped Jacuzzi at night. It’s especially pleasant to read books (which can be borrowed from the hotel’s library) in the shaded hammocks near the beach. The open-air restaurant prepares a number of tasty dishes. Ingredients are local whenever possible (and include fresh fish and vegetables), and there are both international and traditional options to choose from. The cozy bar serves delicious tropical cocktails and ice-cold beer. The rooms at Clandestino are spacious, clean and classy. Built with local materials, including teak, royal palm and bamboo, and painted with natural tones, the rooms have an appealing aesthetic. Large sliding glass doors let in natural light and open onto private balconies that overlook the hotel gardens. Air conditioning and ceiling fans ensure a comfortable temperature. There is a safe deposit box for valuables, and a TV that’s connected to a hard drive loaded with movies, documentaries and music. Wireless internet is offered throughout. The bathrooms feature stone-showers and antique copper faucets. They also have a hair dryer, magnifying mirror, and organic toiletries. Both king and queen size beds are offered, and certain rooms can be connected – a feature that is great for families or groups traveling together.